Usually as fall approaches the egg production slows down. On Sunday this fridge had just that one lonely chicken in it. 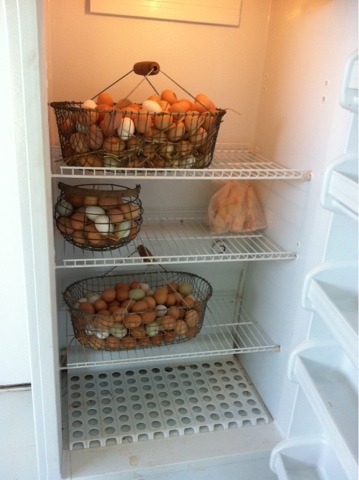 By Tuesday afternoon there were 28 dozen eggs! There have been many design changes to the laying hen pens over the years. The girls love dirt baths, bugs, grass, weeds, poison ivy, roosts that hold the entire flock, plenty of air, grit and such. They are still making plenty of beautiful eggs every day! Our egg CSA runs out in October. We work to make certain that 26 weeks worth of eggs are delivered, it is all based on the number of weeks we have 10+ hours of daylight, the number that works magic on egg production. This spring we went from almost no eggs at all to suddenly having 10 dozen eggs each day, and the switch in the fall is just as abrupt. I just hate it when that day arrives, the eggs are missed in the dark days of winter.